The Sears Ivanhoe was first sold in 1911. It was a high-priced house "designed by one of Chicago's leading architects", according to the catalog. That statement had me wondering: who was the architect? The Ivanhoe is clearly a Prairie School house. We already know that John Van Bergen designed a couple Sears models. But who designed the Ivanhoe? Based on the wording in the catalog, it's likely a familiar name. I was recently in River Forest and I saw a house that strongly resembled the Sears Ivanhoe—but it wasn't one. 601 Bonnie Brae, River Forest. The house in River Forest is known as the Elias V. Day house, built in 1907 from plans prepared by Tallmadge & Watson. Day was an impersonator, entertainer, artist and author who paid $6,300 to construct the house at what was then 40 Quick Avenue. Tallmadge & Watson was a famed architectural firm founded by Thomas E. Tallmadge and Vernon Watson in 1905. The firm was known for their residential and ecclesiastical designs. Did Tallmadge & Watson rework the plans of the Elias V. Day house for Sears? The floor plans are different and clearly the houses are not identical. The Day house is lacking the dormers or the side porches. The houses have the same roofline. 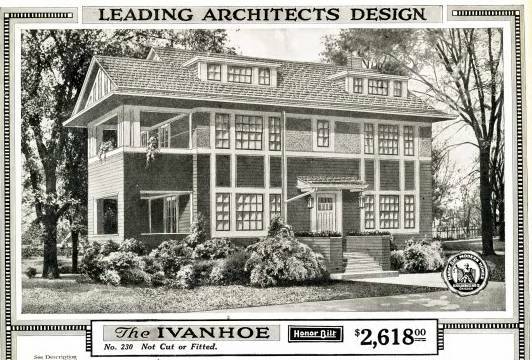 And the Ivanhoe has one hallmark of Tallmadge & Watson designs--the integration of the casement windows into the patterns of the wood banding. The Day house was featured in several national publications including Western Architect and Modern American Homes (1913, shown above). I'm not the only one who noticed the resemblance. The late Jeanette Fields, noted preservationist, historian of the Prairie School, and Sears home researcher, wrote, "It seems likely that the architects, Tallmadge & Watson, sold the plans to Sears after the Day house was completed in 1906." I agree, Jeanette. But how can we prove it? There are essentially only two ways to determine the architect of a Sears house. The first way would be to get a copy of the actual Ivanhoe blueprints and check the architect name. There are only a handful of Ivanhoes known to exist today, and there is a low chance that the blueprints for one of those houses can be located 100 years after construction. The second way is to locate an original building permit. Typically, towns would ask for the name of the architect on the permit. For a Sears house, sometimes the actual architect was listed in the Architect field, and sometimes "Sears Roebuck" was listed. Unfortunately, most municipalities do not retain building permits for 100 years. Are we at a dead end? I have reached out to a few of the Ivanhoe owners. If you have any information about the architect of the Ivanhoe, please comment below. Wow, very interesting. Wouldn't it be cool if one of the Ivanhoe owners got back to you with something! Or one of the architects at Sears borrow and adapted the Tallmadge & Watson design. I think your 100% correct the Sears Ivanhoe is based on the Tallmadge & Watson design, but it was very common to steal a popular design and make enough alterations to claim it as a unique design. Just came across this excellent post! I really appreciate the historical work you've done here. Can you please provide the source for your quote from Jeanette Fields?